Now, here’s a movie that by all accounts should be dead on arrival. It’s based on a series of Pepsi commercials (hell, Pepsi is credited as a production company at the start), it stars a range of legendary basketball players (i.e. untrained actors), and the film’s big gimmick is that they are all dressed in old-age makeup, paving the way for a collection of geriatric humour with the main gag being that they’re not that old at all. Just the idea of it alone stinks of corporate cynicism, akin to how movies from the 1990s like Space Jam were made and marketed with the sole purpose of generating money, and the trailers really did make it seem like this was going to be one hugely manufactured embarrassment this side of The Emoji Movie. Yet, for everything it has going against it, Uncle Drew is really not that bad. It’s no masterpiece by any means, but the fact that there is genuine effort put into this script, these performances and especially its sense of humour instantly makes it a way stronger movie than it has any right to be. As stated earlier, the movie is based on a series of advertisements by Pepsi that feature NBA all-star Kyrie Irving in full old man prosthetics and make-up as “Uncle Drew”, a geriatric who surprises younger basketball players with his skills on the court. Irving reprises his role in the feature, which sets him up as a legendary basketball player who disappeared after he and his teammates failed to show up for a match at a championship held in Rucker Park, New York. 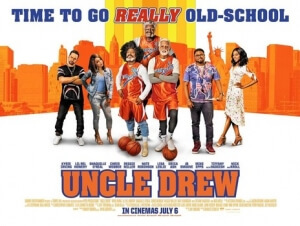 In the present day, Uncle Drew is sought out by aspiring streetball coach Dax (Lil Rel Howery), who has just lost his entire team to rival Mookie (Nick Kroll), and has been dumped and kicked out by his materialistic girlfriend Jess (Tiffany Haddish), to compete in this year’s tournament. Uncle Drew naturally accepts, and together they set out to reunite the team – including Preacher (Chris Webber) who now resides as a minister, Lights (Reggie Miller) who is now legally blind, Boots (Nate Robinson) who is living in a retirement home and seemingly no longer with the ability to walk or talk, and Big Fella (Shaquille O’Neal), a dojo master who still harbours a grudge against Uncle Drew for a past fidelity – and train them for the match of their lives. It’s weird, because I saw this movie the exact same day I watched another generically-plotted sports movie, Swimming With Men, and while I thought that movie wasn’t terrible it certainly played things very safe and didn’t strike that many laughs. Oddly enough, it was the movie I was dreading the most out of the two – for all the reasons I listed in that first paragraph – that I genuinely had a more fun time at, and certainly chuckled a lot harder at, because it kind of knows it’s a corporate sell-out but really tries to have fun with how much of a corporate sell-out it is. There is certainly product placement, but to the film’s credit it’s very subdued and not forced too much into the dialogue or the frame, and when it is it’s at a moment when it makes sense for the scene or the character to do so – instead, it takes that focus and places it into its jokes, which even more surprisingly land on their feet more often than they fall flat on their face, which is probably why they got talented and established comedic actors like Lil Rel Howery, Tiffany Haddish and Nick Kroll who can deliver even the weaker material and gain a laugh just from their deliveries. I was genuinely surprised by how much effort was put into something that was so clearly made to be a commercial tie-in, and while of course it’s leagues away from similar successes like The LEGO Movie the jokes are amusing enough to keep your entertainment levels steady. As for the main players themselves (figuratively and literally), again they are not professional actors – except for maybe Shaquille O’Neal, but given his infamous backlog of films like Kazaam and Steel, that’s highly debateable – but here, they’re really not as terrible as one would expect. Sure, some of them are a little stilted in their deliveries, which are complicated by the fact that they’ve got to act like old men for the whole movie, but when the movie calls for a few emotional moments they handle the material just fine, and their performances even give the film a little bit of a sincere heart, because regardless of their acting talents you can tell that they really want to be there to tell this story and have some fun underneath all of that make-up. Even Shaquille O’Neal, who let’s be honest has never been a particularly good actor, isn’t that bad here, and I’ll be completely up front, I kind of find him adorable whenever he’s acting on-screen; I know he’s not good, but he’s just so goddamn delightful at not being good, and here he never fails to get a smile out of me, because you know he’s trying his hardest even if his hardest isn’t particularly strong. This is a film that, once again, should have been awful from start to finish. That’s not to say any movie based on a series of advertisements is impossible to pull off – after all, Johnny English was based on a recurring character in Barclaycard adverts, while Jim Varney made a whole career out of playing Ernest in dozens of films following a popular run during television ad breaks – but there was just so much going against it, from the non-professional actors cast in lead roles under make-up that’s straight out of a Nutty Professor movie, to the fact that Pepsi was a major production company involved with it, that there seemed to be no way up. However, while it’s not even close to being a truly good movie – the plot is very generic to a fault, and once or twice a gag doesn’t make its mark – it is still a funny and reasonably entertaining one… which is still some kind of mini-miracle that it’s this good at all. Uncle Drew may seem like there’s a lot going against it, but it’s a lot funnier and sweeter than one might be expecting.